If you’re wondering whether this is the pizza place where Macaulay Culkin’s band played, then you’d be right. The ‘Home Alone’ star’s troupe did try out some of their pizza-themed Velvet Underground numbers here. Luckily the pizza went down better than the rest of The Pizza Underground’s tour, so the crowd won’t be booing these dough pies. They’re served fresh from the oven in either 12-inch or 18-inch stonebaked sourdough rounds. Toppings range from classic margherita to the meat-tastic ‘Full House’, with pepperoni, spicy ground beef and flavoursome slices of own-made fennel sausage. And if you do want to ‘Take a Bite of the Wild Slice’ specials include pulled-pork pizza with apple sauce and crackling. We were too scared to try that one, though: it sounds almost as ill-conceived as Culkin’s dreadful covers act. Speaking of covers, there are only a couple of tables and most of the trade is takeaway, but the jazz-funk soundtrack and chatty staff made it a fun place to hang out on our visit. To get you in the mood for all tomorrow’s parties there’s Asahi beer, Brooklyn Summer Ale or wine. In case you need to bottle a band off stage. 5-11pm Tues-Fri; noon-11pm Sat; noon-10pm Sun. 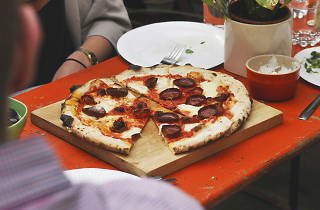 Best pizza in London - recently went to Naples, Yard sale is better!! A beautifully made pizza! My brother and I shared this Ooh Mama pizza, which had buffalo mozzarella, chillies, papadew peppers, and rocket. It had a good kick from the spicy peppers and chillies, which I enjoyed! As for the cheese, I thought there could have been just a tad more on the pizza. The crush was good, as it was thin in the middle and a little more chewy on the ends, which gave it a good bite. It didn't take long to arrive either, which was great because I was rather hungry. Not only a great neighbourhood restaurant, awesome takeaway and the only good delivery joint, it's also the best damn pizza I've ever eaten. Finger-lickin’ lip-smacking droolingly good, hands down the best pizza joint in Hackney. Yard Sale offer really interesting toppings and the combinations work perfectly. We pushed the boat out and went for the mighty meaty Full House and it was so delicious. Good quality thin base, perfect ratio of sausage, pepperoni, beef, olives and peppers, and the mild mozzarella style cheese worked great beside the spicy meats. They also offer brilliant sides and desserts- we were super impressed with the cheesy garlic pizza bread, only £5 but it was nearly as big as the pizza. If you haven’t already you should definitely visit this excellent addition to Lower Clapton Road, these pizza pies are made with great love, care and attention. I had heard so much about this place that I was really excited to try it, so I ordered a delivery from their new Blackstock Rd location. The menu looked creative and different from most other pizza restaurants in London, which was a promising sign. But the positives pretty much stopped there. The delivery guy promptly ignored my express instructions not to buzz on the door (I have a baby who had just fallen asleep) causing mayhem at home. When I finally got to the pizzas (I ordered two 12" pizzas - pepperoni and broccoli), they were disappointing, especially given all the hype surrounding Yard Sale. The broccoli one was just fine (hence the second star), but the pepperoni was a total let down. The crust was completely overdone and the whole pizza felt like a cheap ready-made item someone popped into the microwave for 5 minutes. It might be that the Blackstock Rd location is new and still learning but, for the time being, there are many, many places that serve far better pizza in the area, let alone the rest of London. 12pm sharp. A friendly queue that soon dissipated for my own very pleasure and rumbling tummy. Pepperoni or margherita? Meaty days are over so I optioned for a classic margherita. I decided to eat in as I had some time to kill. It's not a big place but a cosy one (I quite enjoyed seeing the busy piazollos cracking on their business and pizzas being made in the wood fire oven). Yard Sale Pizza is not the kind of place you would bring your children but your mates after a gig in a basement somewhere I'm north London. Yes, the neon signs are subtle but effective, creating that New York atmosphere of a 24 hour pizza joint. The pizza wasn't greasy tough. It was actually a very good one: crispy, hot and thin. The cheese melted in my mouth perfectly (the quality of the cheese was something!) and I just wished there was a bit more of tomato sauce - just to balance things out and not make me feel that I was eating a four cheese pizza instead. The service was quick and the staff uber friendly. I would definitely come back and try the Squash. Favourite pizza in London! Great service. Absolutely delicious pizzas! Great, friendly service and exciting specials. Keep the good work up guys! Best pizza, all my friends are obsessed with the TSB. Good value, good vibes - highly recommended! I have NEVER been disappointed with my pizzas from Yard Sale. Sometimes my mouth waters just thinking about their pizzas. The base is excellent with an orgasmic mix of toppings. super good generous pizza, very friendly staff & relaxed spot. salads are also amazing! i recommend! Amazing pizza. Gluten free too!!! So so good, and lovely staff. Great quality Pizza to your doorstep! We have yard sale pizza at least twice a month. Until now there has never been a pizza takeaway I would want that often. Amazing flavours and you almost feel like it's healthy....especially the TSB. 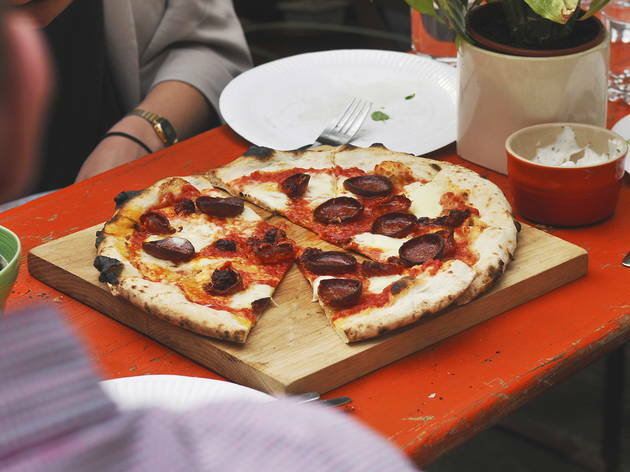 pizza perfection and local heroes the best alternative options and quality ingredients ! Taste and size...really good for an italian ! Best pizza in Hackney by a mile. I love this pizza - amazing dough and crust, and their tomato sauce is full of flavour. Really happy a great delivery pizza place has finally come to Hackney! Bad boy pizzas, good beer, killer tunes... and they deliver! Holy moley that holy pepperoni is out of this world. I probably have two a week and they always blow my mind!!! T ..... S ..... Mutha fu*#in ...B! All I gotta say! Some of the best pizza I've ever had. Best pizza base around. Favourite local pizza! Great pizza, great vibe and great people. These boys are throwin out Pizzas that a Ninja Turtle would be proud of...GET IT IN YOUR FACE! The BEST pizza I have ever eaten (outside of Italy)!! Hands down. Yard Sale is legit! Propper Italian style pizza. I've seen the ingredients they used stacked up in the restaurant. All Italian. Recipes are really creative - The butternut squash & goats cheese one is the bomb! But the thing I like most is that is probably one of the only new businesses I've seen pop up in Clapton that's frequented the whole Clapton community, not just hipsters. The generous size of the pizzas might have something to do it! Awesome Pizza. Best in London.